Calling F1 Experts: Who Autographed This 1960’s Shirt? 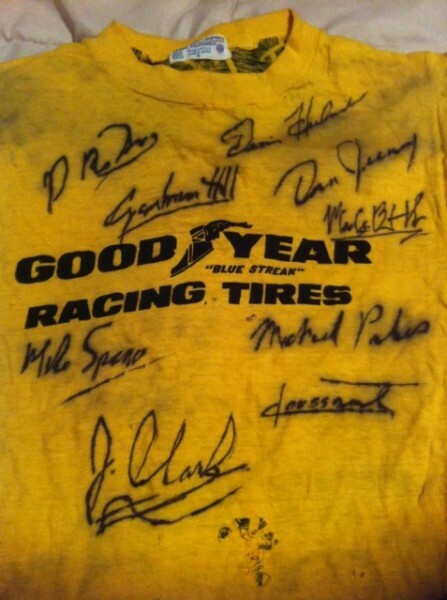 The question for you, is: Who else autographed this shirt? 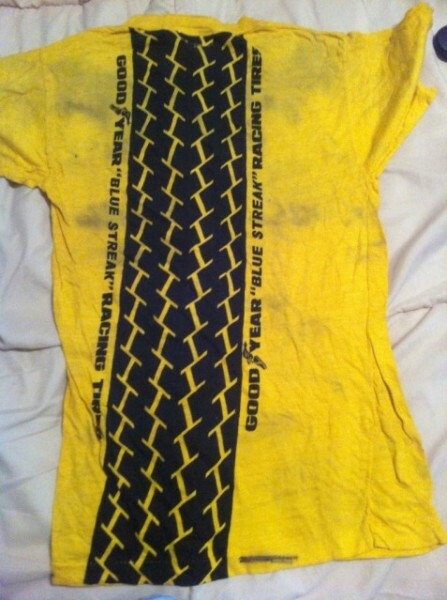 Can anybody confirm which race it was from? 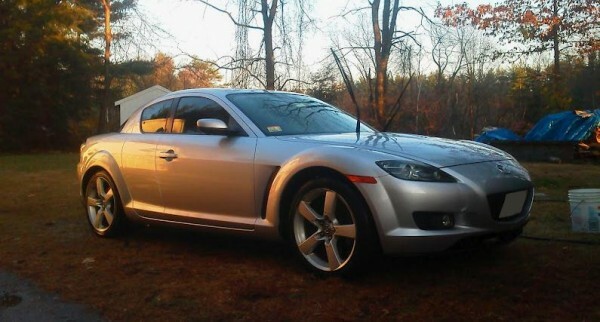 1A Auto Blog Asks: How Often Do You Really Wash Your Car? Last weekend was beautiful outside, so after a much needed yard clean up, I wrapped up my day by washing some cars of their wintery mud & salt. As I was washing the bugs, dirt, and mysterious goo off I began pondering, how often do other people wash their cars? Do I wash them more or less often than my peers? So I’m throwing the question out there for you guys to enlighten me. Are You Ready For The New Top Gear USA Season? Last year we discussed the new Top Gear USA that had graced our TV’s for the very first time, and there were some mixed reviews. I personally liked it, but hoped that the whole thing would get a bit less “stiff” as the season went on. Luckily, it did. By the end of the season, Tanner, Adam, and Rutledge were really drinking flowing together quite well. It’s now a year later, and we are just one week away from the new season beginning on February 14th at 9pm on the History channel. Will you be watching this season? Will you forget that it’s also Valentines Day? Here are the promo’s for your viewing enjoyment. 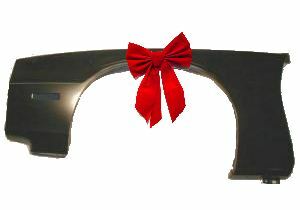 Whats The Best Automotive Related Gift That You Have Ever Received? For as far back as I can remember, I have been asking Santa for many different automotive related objects. 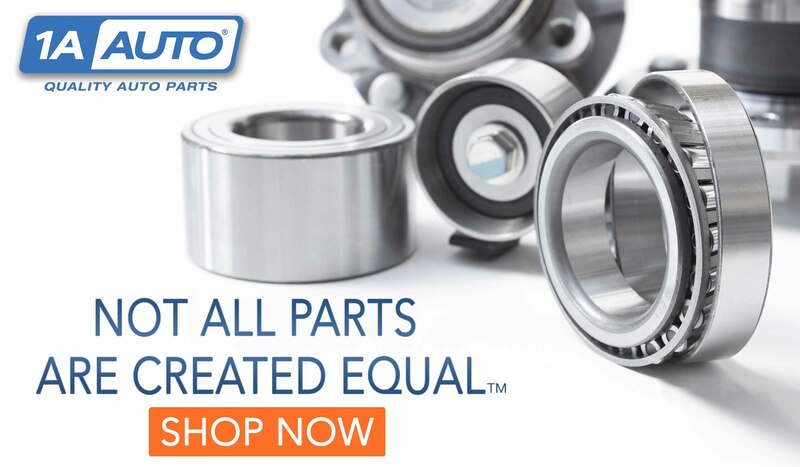 From metal working tools, to entire body panels, to lightly used engine parts, my wish list has included just about everything. Sometimes Santa and his elves pulled through for me, and other times the request was just a bit too lofty. Now that I’m a bit older, I realize just how lucky I was (still am), and how difficult it must have been for Santa’s elves to assemble all that they had back then. One of my favorite automotive related gifts that I have ever received was the “Standard Catalog of American Cars 1805-1942” and the “Standard Catalog of American Cars 1946-1975”. I know, it seems a bit dorky, but my par… ehem… Santa gave them to me when I was a kid, and to this day, I still find myself flipping through them as excitedly as the day that I first got them. I cannot imagine how much time I have invested in those books, but it is crazy for sure. 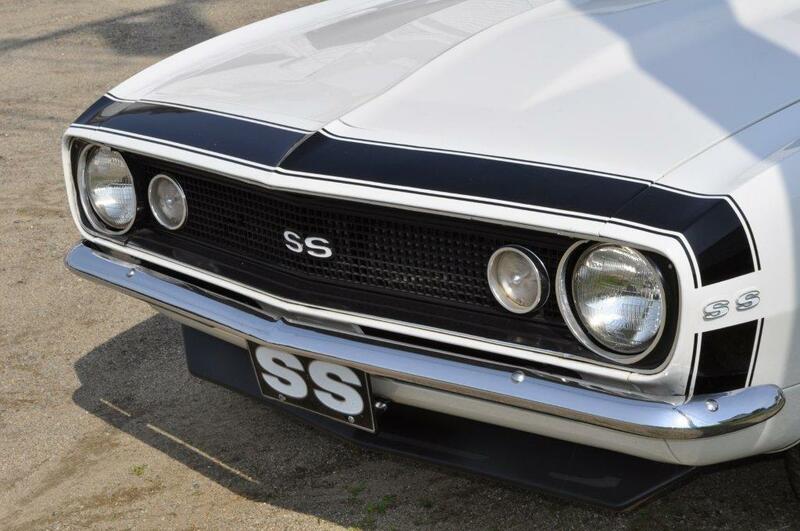 So what’s the best automotive gift that YOU have ever received? 1A Auto Blog Asks: What Car Do You Most Regret Buying? If you’re a typical car enthusiast, you have likely owned a few really terrible cars over the years. When you bought them, they weren’t terrible. In fact they probably seemed like a great deal at the time. A little bit of elbow grease and you would be hitting the beaches, and living the dream! If you really played your cards right, you may even sell it for a profit. Then reality hits you in the face like a full pedal’s worth of old brake fluid. Yea, we’ve been there. So which car is your automotive nemesis? Tell us a story. 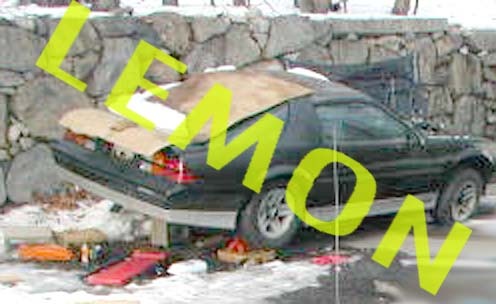 1A Blog Asks: What’s The Ideal Car For Carmageddon? By this point you have probably read or seen on TV that the Los Angeles 405 Freeway is shut down for 3 days. This horrifying event has now been appropriately nicknamed “Carmageddon”. Why? Because all of that 405 bound traffic will now end up super saturating the surrounding areas, causing people to become highly irrational. If LA traffic is anything like Boston traffic, we can surely count on enough foul language and rude hand gestures to last us 37 lifetimes. The kind of filth that will be screamed out the side windows of these marooned vehicles will be atrociously offensive in ways that we don’t even understand yet. Best case scenario is that Merriam-Webster gains a few new verbs from it. Now that we understand that no word with “ageddon” on the end is ever a good thing, how does one make the best of this bad situation? Well, the only way is to make sure that you are the person driving the most Carmageddon appropriate vehicle. What kind of vehicle is it? What options are must have’s for keeping your sanity during hours of traffic? A/C ? Super Swampers? Shark rockets? You tell me! 1A Auto Blog Says: Name That Bench Seat! Last weekend I went to the monthly car show / swap meet in Amherst NH and I saw this bench seat that had me quite intrigued. I am pretty sure that I have never seen one of these seats before. The owner of this seat thinks that it is from a 1968+ GTO, though he isn’t 100% sure. So I ask you – What in the world did this seat originally come out of? 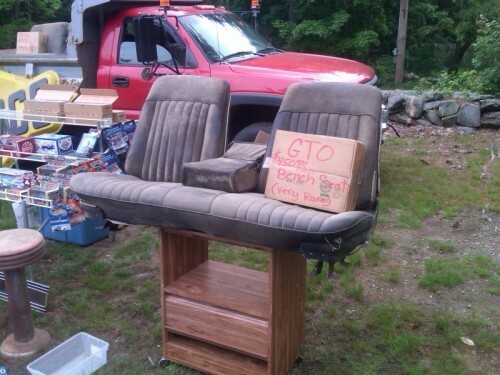 Is it really a GTO seat? Some other A-Body? Drop some knowledge on me.